When I got to know that Fab Bag has collaborated with Brands like SUGAR, Tvakh, Just Herbs, and other Good Brands, it really made me feel happy because these brands are well known and never fails to impress. Earlier, people used to say that most of the Fab Bag products don't suit their skin. But gradually, Fab Bag improved their quality and people are now loving their curation. No Doubt, Fab Bag is the most affordable subscription service in the market. This month's Bag is coming in two color variants. One is Barbie Pink and other is in Coral Shade. I so wanted to have the Pink and luckily, I got it! 😃 So this made me happier. The quality of the bag is much better than the earlier ones I tried. It has a soft leather touch which looks really cool and this has a tiny loop hole too which makes it easy to carry. Now let's see what's o July Fab Bag. They let me choose the makeup product for July Fab Bag. And Between Vivid and Crayon Lipstick I decided to go for Crayon Lipstick in Shade - Cherry darling and I am proud of my choice. 😎 I got SUGAR Sharpener free with this Crayon Lipstick. I Love the formulation of SUGAR Lipsticks. Be it Creme or Matte. This one is from their matte collection and it doesn't make my lips dry at all. I don't even feel like I have applied something on my lips. This is the first time I am loving a Matter Lipstick so much. No parabens, No sulfates, No phthalates, No petroleum oils, No GMO, Non- Comedogenic. For All Skin Types. 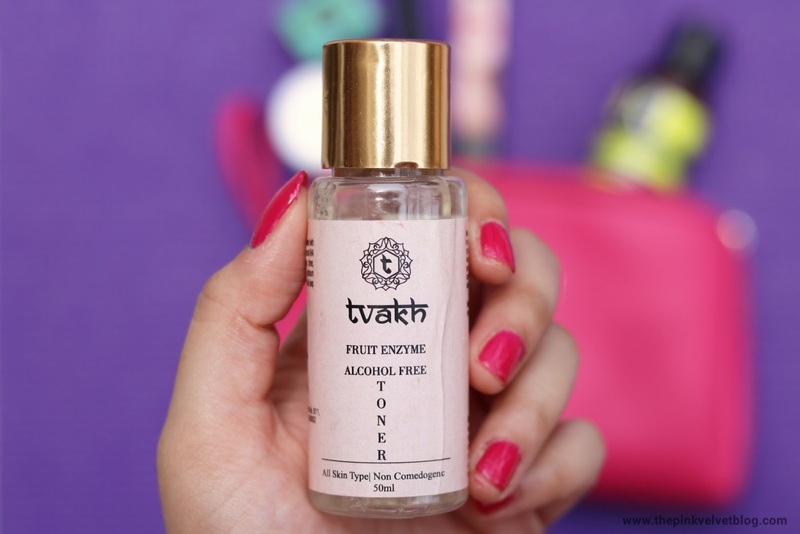 Tvakh’s Fruit Enzyme Toner is designed with premium fruit extracts that contain natural AHA and BHA activity that deeply cleanses, tones exfoliates, reduces pore size with optimum hydration. A multitasking product that will keep your skin smooth and radiant. A medium-coverage skin tint with Broad Spectrum Sun Protection. Blurs Imperfections, Masks large pores, and primes Blemishes. Suits all skin Types. Vegan and Cruelty-Free. SLS, Paraben, Silicone, Mineral-Oil Free. Citrus blend daily shampoo gently cleanses the hair while delivering some acai extract and pure essential oils that moisturize the hair cells deeply. Your hair gets hydrated and shiny in no time! The products are pretty impressive!! Also, the bag is super cute. You've received some nice products in your July Fab Bag. The shade is very gorg! Wanna know more about the toner.